Liz and Dave King visited Annecy, a historic canaled town in the French Alps, and enjoyed the stunning scenery, great local food and relaxed atmosphere of the lakes and surrounding areas. 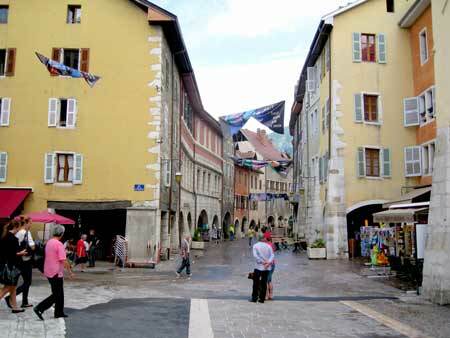 Our visit to Annecy was a trip down memory lane, and we found lots of lanes to explore in this historic town in the French Alps. Historically it was part of Switzerland until it was finally reunited with France in 1860. It hosted the Winter Olympic Games in 1992 and is a potential host for the 2018 Winter Games. It’s a thriving town, with a small historic centre and a booming cosmopolitan tourist centre, a lively student population and markets held on Tuesday, Friday and Sunday throughout the year, set on the beautiful Lac d’ Annecy. There are numerous historic buildings, museums and monuments to see, far too many to see in a day. Since the 12th century the castle has dominated the old town which has kept its arcaded houses, its churches, its narrow bridges and its sluice gates, its canals and its fountains. We took the ferry, it’s a short and pretty cruise, from Doussard on Lac d’ Annecy to the port of Annecy where we strolled round the Old Town, through the cobbled streets and along the canals, and stopped for a coffee. Lunch was a gastronomic regional speciality, a hefty cheese fondue made with local cheese accompanied by a platter of assorted cold meats and piles of cubed French bread which rendered us almost incapable of further activity so we sat beside the lake in Les Jardins de l’Europe and watched the world go by. The Lake of Annecy is internationally famous and in summer sailors, board-sport enthusiasts, swimmers and fishermen take advantage of its temperate waters which vary between 22°C and 24°C from June to September. Its fame also depends on its clean water which is considered among the purest in Europe and this is partly due to the attention given to the water quality on a daily basis assisted by the surrounding marshes which help to purify it. Had we felt energetic, we could have cycled along the panoramic lakeside “green tracks” or hired a boat and gone for a sail; you don’t need a permit to hire a craft on the lake. There are nine beaches situated around the lake but they are popular even early in the day. Aix-les-Bains, a favourite haunt of Queen Victoria, was an interesting spa town, but we decided that the lake is nowhere near as impressive as Annecy. 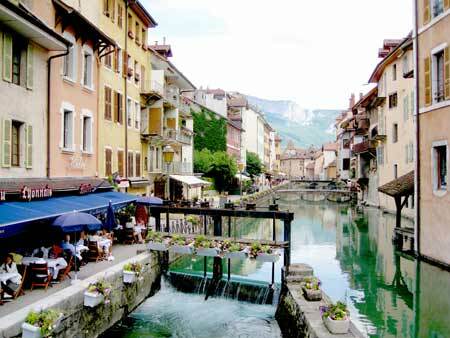 Annecy is an expensive area, but not as expensive as Switzerland. About one hours drive away from Annecy the village of Yvoire was also recommended to us as being nicer than Geneva, but we didn’t have time to visit it. Will you? Camping La Ravoire on the west side of the near Doussard is a busy family run site, so we suggest booking in advance. 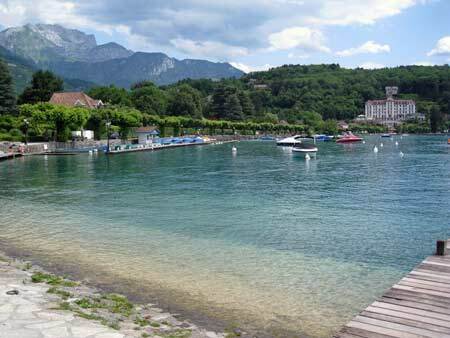 It’s just 800m from the lake and 18 kms from Annecy. 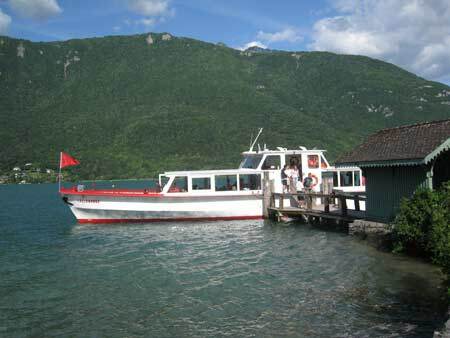 It’s ideal for motorhomes as you can cycle or take the ferry to the town. English is spoken. If you are travelling to France this year make sure you have European travel included on your motorhome insurance policy. 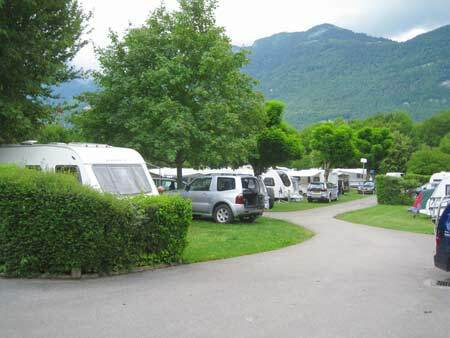 We’ve found this site which is open from March – http://www.annecy-camping-municipal.fr/tarifsreservation/ It’s located at the foot of Semnoz mountain, overlooking the lake. Click here for further details.